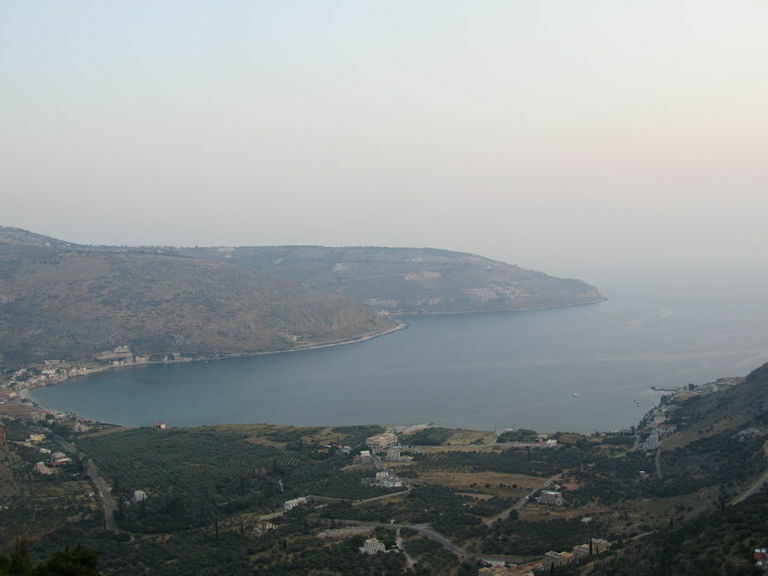 The Mani area lies in the Peloponnesus peninsula. It is divided into two parts, the Messinian Mani which lies in the Messinian municipality and the Laconian Mani, which lies in the Laconian municipality. From the ancient times Mani was a developed area with a brilliant civilisation. Many archaeological sites can be found in the area. 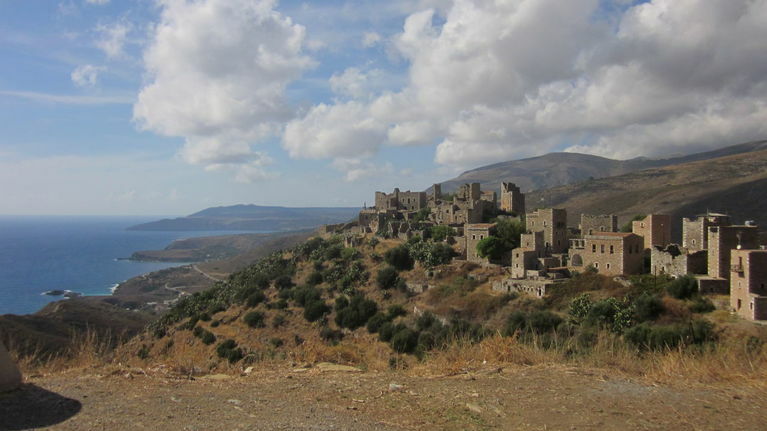 In the older times, Mani was one of the only places in Greece which remained untouched by the Turkish armies conquering Greece for 400 years. Areopolis is indeed and incredibly picturesque and historical village, very vibrant at night with numerous places to enjoy traditional greek food and other delicacies. It is also the place to enjoy freshly handmade bread baked in a wood powered oven and purchase delicious vegetables and fruit grown in local gardens. Five miles south of Areopolis are the famous Diros Caves. They are part of an underground river, and the 5,000 meters that have been exposed are fascinating. From the entrance, skilful, whistling gondoliers steer small boats through narrow passageways, around beautiful formations of stalagmites and stalactites, whose colours have been created by rain water penetrating the calcium carbonate in the rock. The caves have served as places of worship in Palaeolithic and Neolithic times; they are thought by many to be connected to the Underworld. In close proximity lie Kalamata, Almiro and Mount Taigetos, well known for possessing one of the richest floras and faunas in the world. It stands proud above the Gulf of Messinia. Almiro is a small settlement by the sea with a clean pebble beach and translucent waters, marking the beginning of the Messinian Mani. The landscape is precipitous, plunging headlong towards the sea. Like a replica in miniature of the majestic form of Mt. Tarygetos, Mystra rises above the verdant valley of Eurotas. In about the Mid 13th century mail-coated Frankish knights built watch-towers on this 'strange hill', from which they could defend fertile Lacedaemon and control the unruly mountain dwellers of Taygetos. However, they were unable to retain their hold on 'beautiful Mystra' for long. A Byzantine 'Basileus and Emperor of the Romans' regained his throne at Constantinople in 1261 and henceforth Mystras became a centre of culture and civilization destined to illuminate the art and spirit of the Byzantine age for the last time. Mystra's achievement is a very important one; but it is the sphere of art in particular that the modern traveller will be most impressed by.Early characteristics of fresco-work are found in the painted decoration of the Metropolis (13th -14th centuries) which already foreshadows the final flowering of the Palaeogene period. Some of the most important works of the 14th century will be found at the Aphendiko. In the Peribleptos a synthesis of rare aesthetic quality and deep theological significance will be observed, whereas at the Pantanassa the visitor is struck by the length of the colour range which the Byzantine painting portrays. 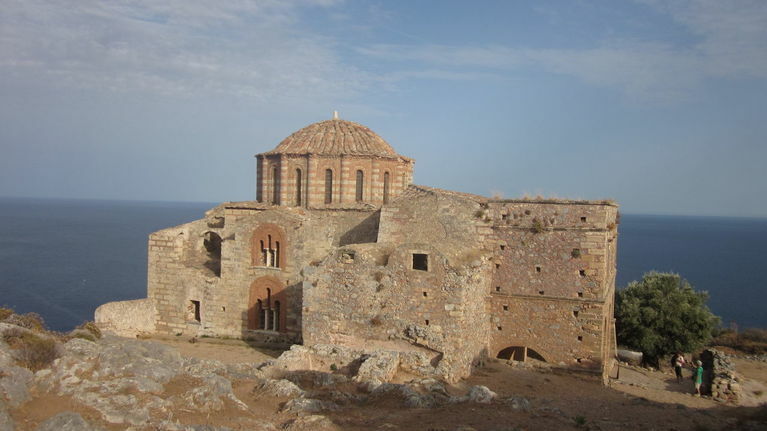 Here also will be found every type of Byzantine church as well as specific examples of decorative architecture pertaining to palaces, mansions and ordinary houses. Kokala, a small traditional village with its uniquely beautiful bays. Is is build amphitheatrically round a small bay, the anchorage of fishing-boats. 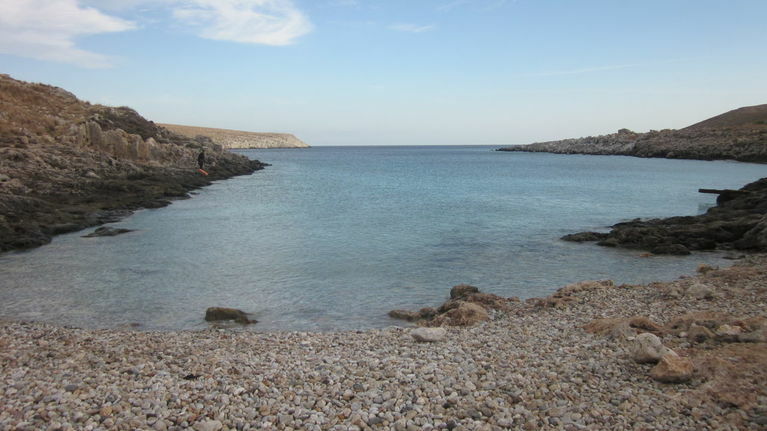 To its south side there is another lovely bay surrounded by blue-green waters. Ageranos (Vathi) One of the most beautiful sandy beaches of Laconia, Located only 15 miles South of Gyhtio. Gythio is a small coastal town on the Gulf of Laconia known as Cranae in antiquity, the port of Sparta. This was the first refuge of lovers Paris and Helen; they eloped here over the Taygetos Mountains from her home in Sparta and set off by ship to Troy. Today, Gythio is the capital of the Mani, the isolated southern fringe of the Peloponnesus named after Maina Castle, built by William de Villehardouin in the 13th century, the same gentleman who gave us the castles at Monemvasia and Mystra. 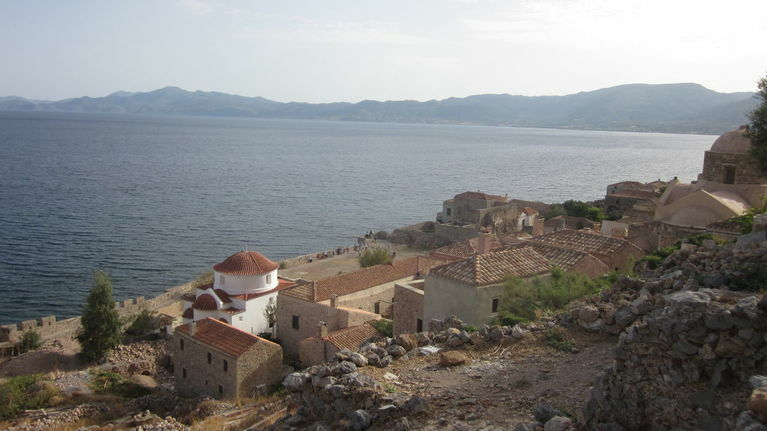 Gythio is noteworthy only as a driving point between Sparta and Monemvasia or Areopolis. 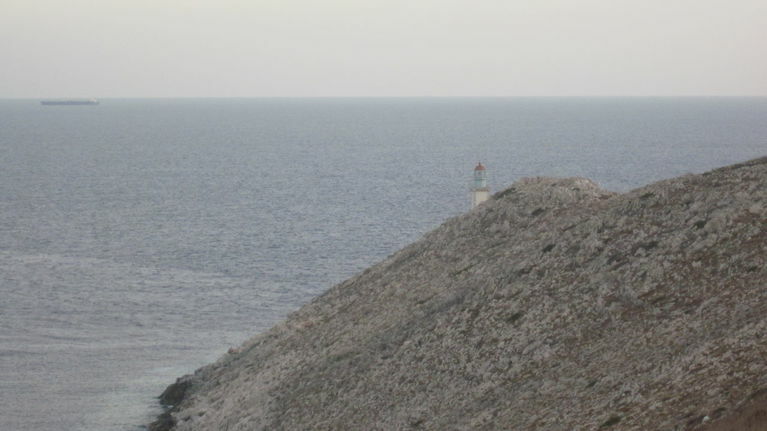 Tall old houses along the seafront of Gythio overlook a lighthouse on the tiny island of Marathonissi, now connected by a roadway to the mainland. Several faded tavernas, rooms to let, and tourist-worn shops line the seafront to Perivolaki Square, all catering to those who await the ferries to Kythira or Crete.Gythio is also indeed the octopus capital of Greece, and most seaside cafes serve this tasty denizen of the Gulf of Gythio..
Kiparissi, to the north of Monemvasia and southeast of Sparta, is a charming coastal village which has recently developed into a resort attracting those who like to "get away from it all". It has three marvellous stretches of beach lining three successive coves. Only 2 miles away from the port town of Monemvasia, over a narrow stone causeway you will find yourself in the "Gibraltar of Greece". This is where the real Monemvasia lies; one of the most beautiful spots of the Peloponnesian coast. It is a 13th -century Byzantine village, more complete than Mystras architecturally, and overrun by flowers. Tucked away on the south face of a hill, shadowed by an imposing fort, is a tiny bit of Paradise. When you enter the vaulted gates to this walled community, you will be delighted by the charm and tender beauty of the vehicle-free village. Hordes of day trippers mob the few cafes and souvenir shops nestled in grotto's of the original Byzantine dwellings, but at dusk peace returns. On top of the hillside is the 13th century Aghia Sophia, similar in style to the Byzantine church in Dafni. The crystal-clear, inviting Aegean below can be reached by the paths that corkscrew down the hill.